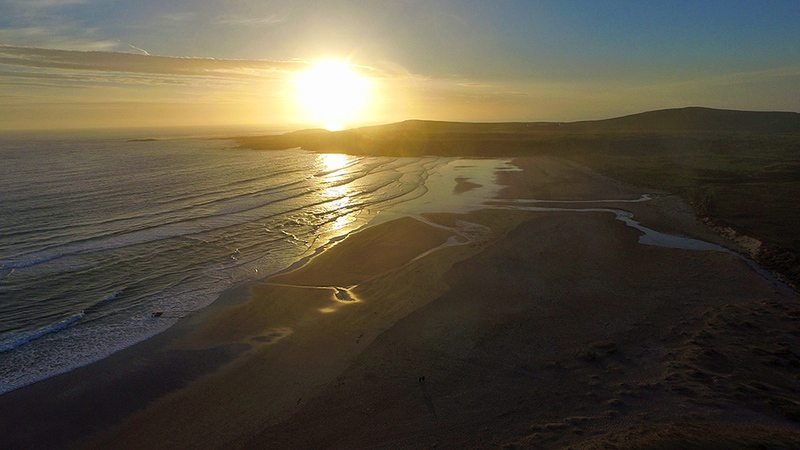 A June sunset at Machir Bay, seen from high in the air above the Kilchoman dunes (taken with a DJI Phantom 3). The Sun is setting behind Coull Point, reflecting on the waves rolling into the northern end of the bay. The wreck of the Patti just visible bottom left, also notice the couple watching the sunset casting long shadows at the bottom of the picture. On the right both Allt Gleann na Ceardaich and Allt na Criche can be seen flowing on to and across the beach. This entry was posted in Beaches, Islay from the air, Landscape, New Post, Sunny Weather, Sunset and tagged Allt Gleann na Ceardaich, Allt na Criche, Coull, Islay, Kilchoman, Machir Bay, Rhinns of Islay, wreck by Armin Grewe. Bookmark the permalink.